I've been really feeling dark denim this spring, paired with more denim, with white, with unexpected items like a leather pencil skirt or brightly-printed midi. 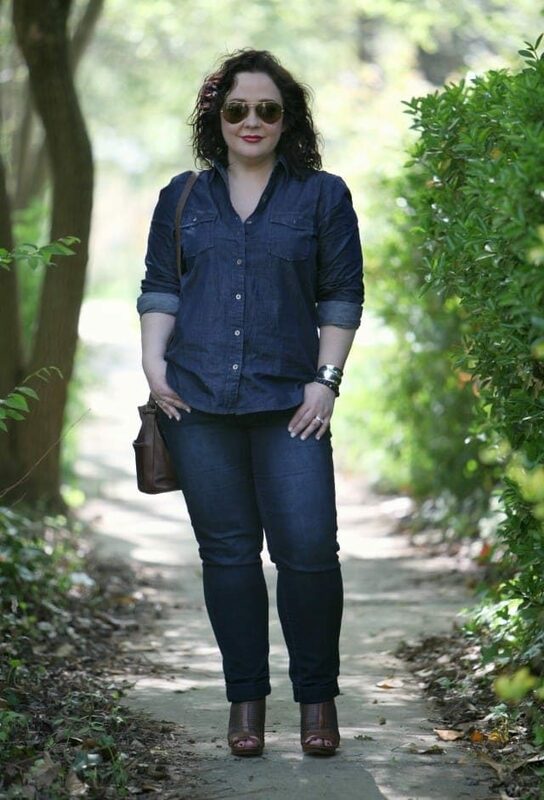 I found this denim shirt on mega clearance at Banana Republic and love that it's richly colored but as soft as a well-worn stonewashed version. Jag Jeans sent me these cuffed skinny ankles and I am IN LOVE. They are made from their Freedom Knit Denim, which looks like traditional jeans, but the inside looks more like loop terry and the denim stretches and moves with you for comfort and shape all day. This is the third time I wore these without washing, which is a testament to the bounceback-ability of this stretchy denim. They're perfect for dashing about weekends running errands, which is what I did in this look. Shoebuy is one of my favorite destinations for shoes; their selection is insane and their prices regularly beat those of department stores and mega-retailers. I actually ordered these very Naturalizer sandals from another company and then found them for much less and with a larger size selection on Shoebuy. Right now they're having a great promo where you can get $20 off an order of $100, plus free shipping and returns with the code MAY100. Along with Naturalizer, they have many other popular brands and great on-trend styles for the season! OK, I’m late to the party, but I had to comment because I like this outfit so much. I pinned it and I ran out and bought a new denim shirt! Perfectly accessorized, as always. I love the shoes. I love how you have your sleeves rolled up to soften the double dark denim monochrome and make it more “Springy.” Perfect, perfect. I love your blog. You pull off the double denim well. think I might have this purse. Still. Somehow? I am an old school Coach hoarder for sure. If I don’t have this bag, I have one really similar. Love it. It looks great. But ‘dashing about’ in those shoes!!! Respect. They would be taxi shoes for me and even then I wouldn’t feel safe. LOL I can only do it because they’re Naturalizer. I’ve worn th to work a few times prior and can’t believe how cushioned and comfy they are for heels, and how secure I feel in them! Just love this look on you. 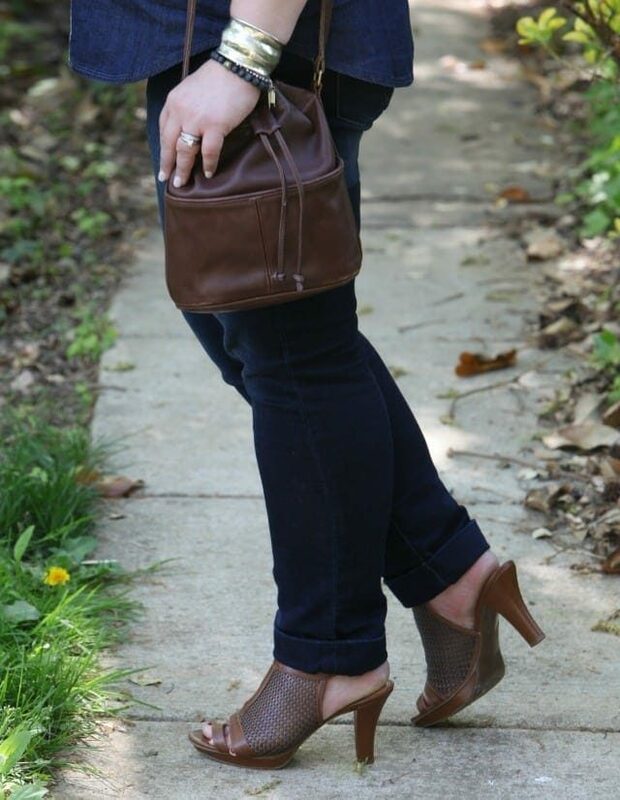 The warm brown leather accessories pop against the dark denim — so rich looking. 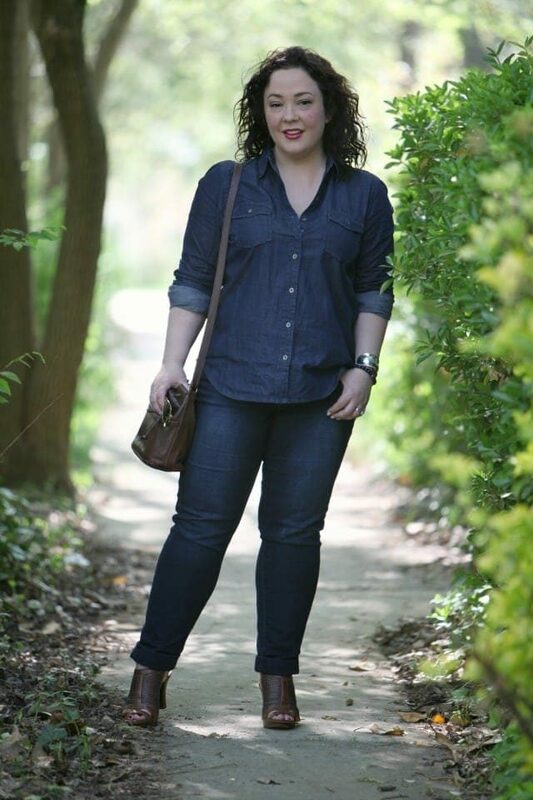 So many cute denim looks in the blogging world today! I love that top! Fantastic look, Alison! I love those aviators on you too. That shirt looks great and super comfy 🙂 I personally prefer double denim to be in different shades I think, but either way it makes a cute outfit for weekend errands!